Mauna Kea Golf Course Weather. 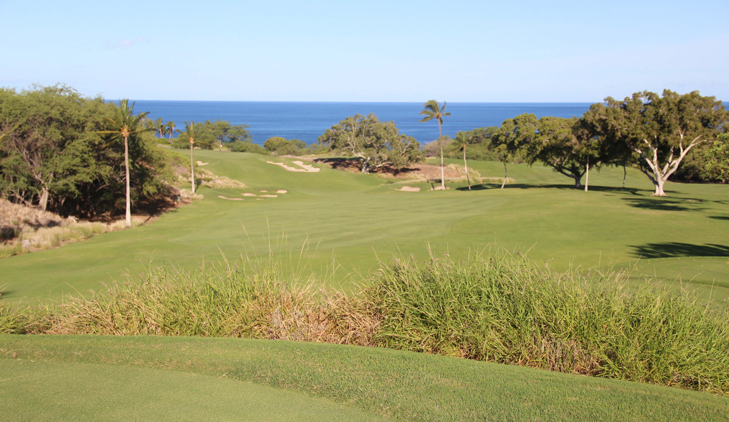 Mauna Kea Golf Course Hole 2: The second short par four to start the day features a beautiful vista from the elevated tee box, and a relatively sedate downhill driving requirement for a fairway metal or other accurate club. The green has a large bunker to the right that must be avoided. Putting will be tricky from any distance outside twenty feet. Mauna Kea Golf Course Hole 3: Pretty much every serious golfer knows about this hole as it is one of the most photographed in the entire world. What most don't know is that from the back tees, it is 272 yards and requires (with no wind) about a 230 carry over the ocean just to reach the front bunker. Most people will play it from the more "reasonable" 220 yard tee box or even shorter, which is advised. 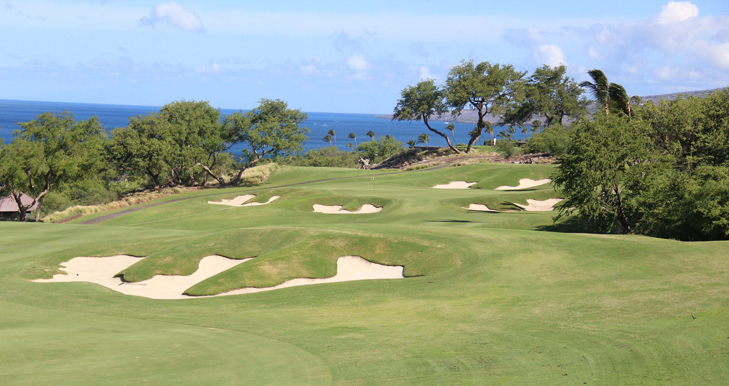 Also, the green has three distinct areas separate by tiers, making the hole even more difficult as merely avoiding the Pacific won't save the golfer from a frustrating three putt. Clearly one of the world's elite holes from any tee, this one is worth the price of admission (plane flight and all). 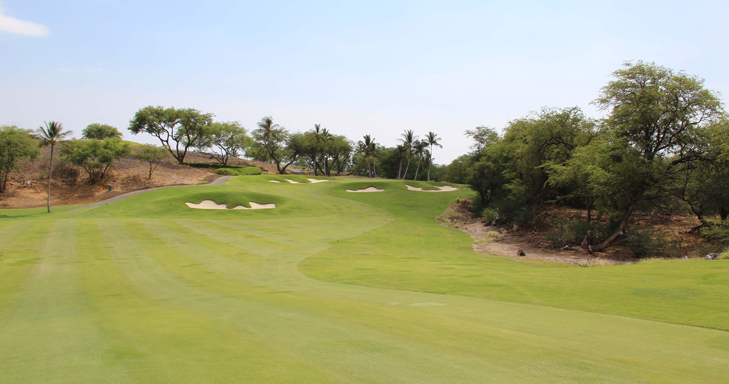 Mauna Kea Golf Course Hole 4: This tough uphill par four has two large bunker complexes in the landing area, trees and lava left and the entry road to the hotel on the right. Thus, the drive is key and then the golfer must hit an uphill approach shot avoiding the huge bunkers short and left of the green. 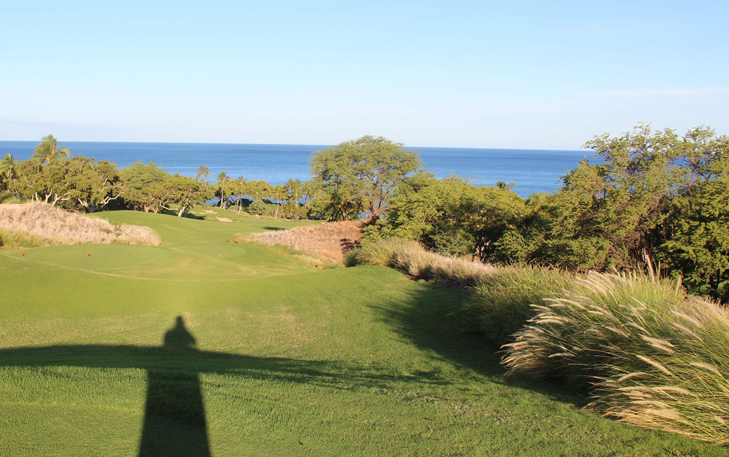 Mauna Kea Golf Course Hole 6: This is a short downhill par four that is not particularly difficult, but affords nice views of the coastline and has a small but tricky green to putt. Wind can also play a big factor in club choice from the tee, swinging the hole from tricky to almost a long par 3 if from behind. Mauna Kea Golf Course Hole 8: The best part about this hole is that, on a clear day it has views of Mauna Kea, Mauna Loa and Hualalai volcanoes. The hole itself requires a layup drive from the tee short of the bunkers, unless the golfer wants to try to thread the needle to give a chance at reaching the green. the penalty for missing the tee shot, is however, at least one penalty stroke. The green is guarded by big bunkers that should be avoided to keep a good score. 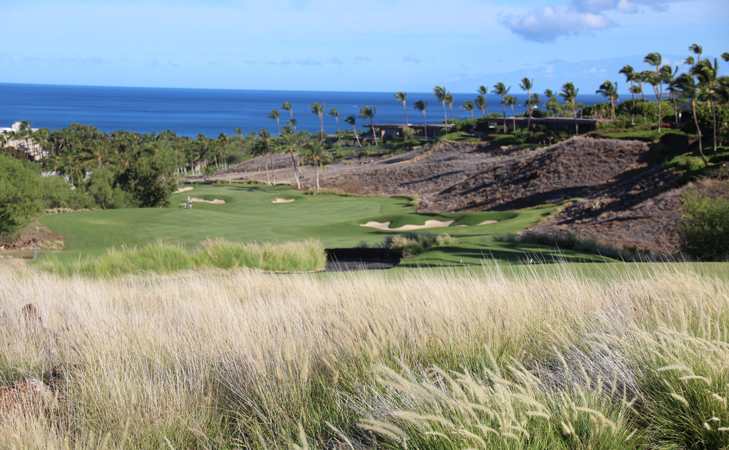 Mauna Kea Golf Course Hole 9: The finishing hole to the front nine is another downhill par four, but this one is a bit longer and more challenging than either number 2 or 6. The views from the tee box are great and the key is making sure the approach shot to the green gets on the correct side of the diagonally running tier to avoid a very difficult putt. 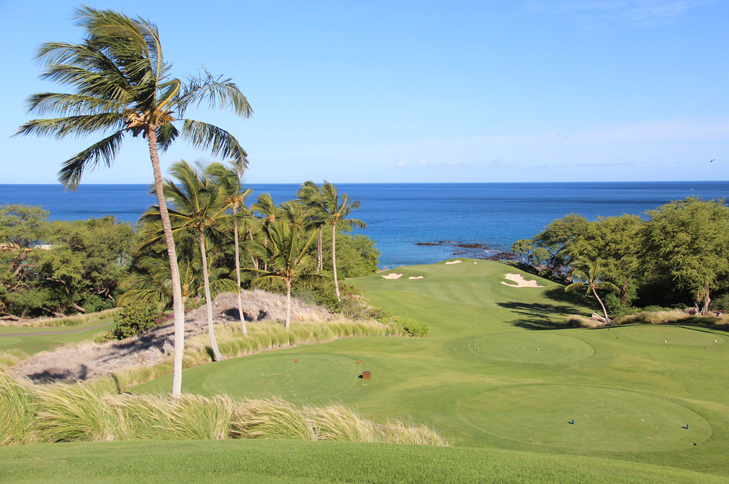 Mauna Kea Golf Course Hole 10: The back nine starts with a big dogleg right par five. The trees and lava to the right must be avoided throughout the hole. However, a good drive can allow the player a shot at the green in two, but the large bunkers should once again be avoided to save heartache. The second half of the green runs away from the golfer. Mauna Kea Golf Course Hole 11: On any other golf course, this would be the signature hole, but this one is out-shined by number 3. Nonetheless it is also very long and challenging, as well as beautiful. The safe play is just to run the tee shot up just short of the green and allow the short game a chance to save the par. Otherwise, anything pin high to the right is in real trouble, and long is just wet and gone, unless the golfer brings snorkle gear. 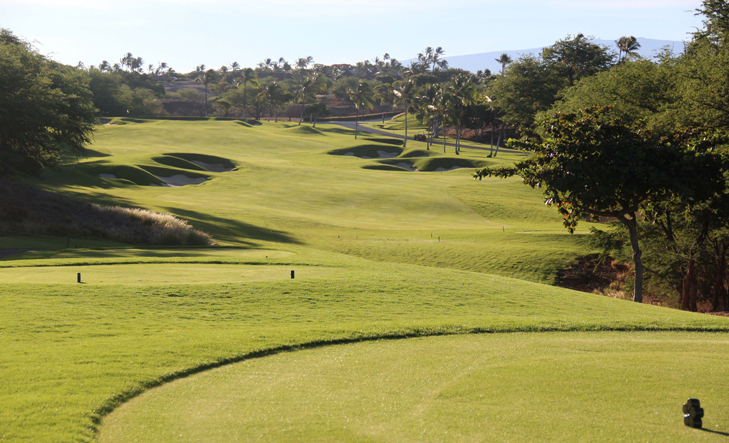 Mauna Kea Golf Course Hole 14: The feel of Mauna Kea changes from holes 13-17 as the golfer climbs in elevation and features a stretch of holes that is more open and running back and forth. The 14th is the strongest of these holes as it doglegs left around a series of bunkers and trees/OB on the left. The green is very shallow and tough to putt from anywhere outside of 15 feet. 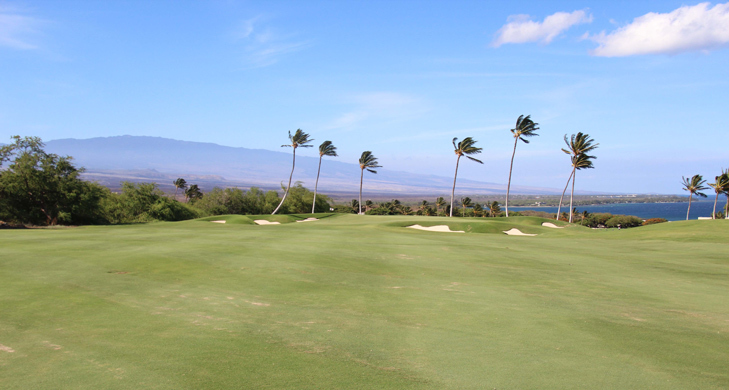 Mauna Kea Golf Course Hole 16: After a fairly straightforward and wide driving area, the approach is to a Palm tree ringed green complete with bunkers surrounding and vistas of the coastline and Hualalai. 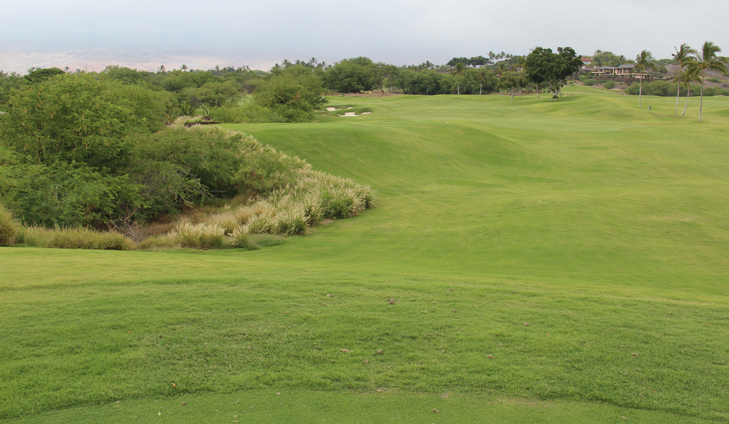 Mauna Kea Golf Course Hole 17: The drive on the last par five of the day should be played over the bunker to the left but short of the bunkers and trouble through the fairway and to the right of the dogleg left. From their the hole goes downhill to the green, but the key to the hole is avoiding the large fairway bunker on the second shot and the deep bunkers around the green. 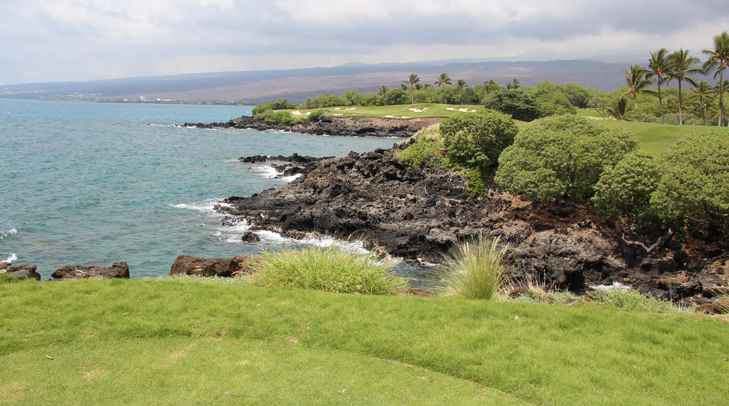 More Big Island Hawaii Golf Reviews are Waiting.